I have to place an order online and want to know is the 14 size in shalwar n kameez is your large size 44. Yes 44 is a large size. We also have a make to measure option available. Hi could you please tell me how i order made to measure? is the measurement given above is the measurement of the finished garment or the body size. 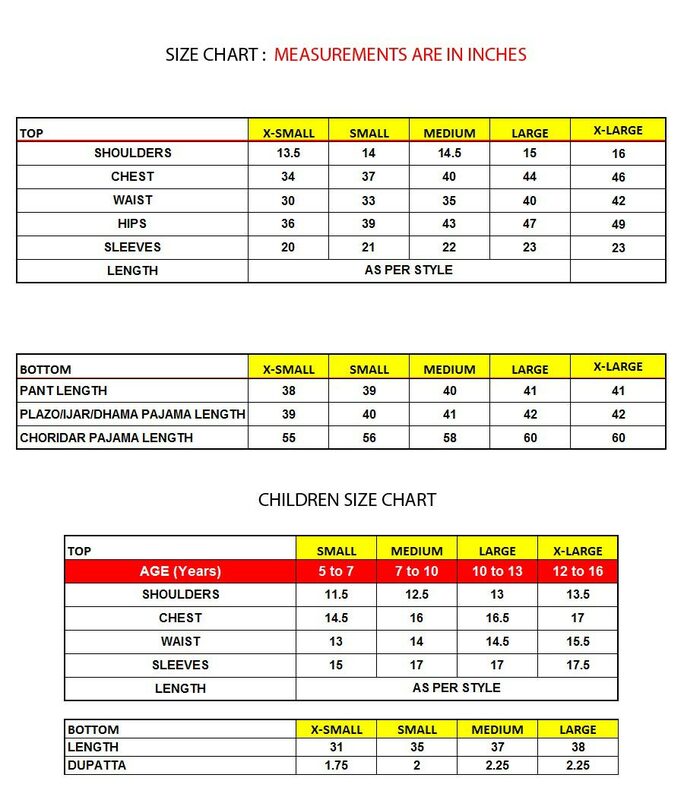 when you click on the product and see the size drop down, there you will find make to measure option. I hope u make the dress exactly shown in the picture. Including the beads hanging on Daman? I m confused about the size chart. Does ur medium size meant for US size 14? hey, in how many days i would get the order? For made to order i dont see the size for hips? Dobyou do it according to waist and chest? and if we want to add lining in chiffon sleeves . How do i tell you that?? The suits are 100% original, we do have own brand name and factory. Don't worry they will be as same as shown in pictures. Size chat is updated now. The suit will be dispatch as same as you see in picture, how ever, a little bit of addition like add lining may be add up, you can tell such notes in Customer Note box on checkout page.